In this post: One way to ensure your dinner party looks unique is to use items not meant for the table. This spring themed party borrows a little secret from my closet. I have a bit of a history of using very impractical things in my table settings. It’s not that I don’t care about preserving my things. It’s just that I view the things I love as fair game to service a beautiful table. That we’d actually be eating a full meal at that table in no way deterred me. So that’s exactly how I came to use a cashmere pashmina as a tablecloth for a spring themed party with friends. The meal and the evening proceeded as planned. A good time was had by all. The pashmina survived. I had gotten it into my head that I wanted to use lilac and green as a celebration of spring. As always, the florals tie the color palette together, with white grounding the whole thing. 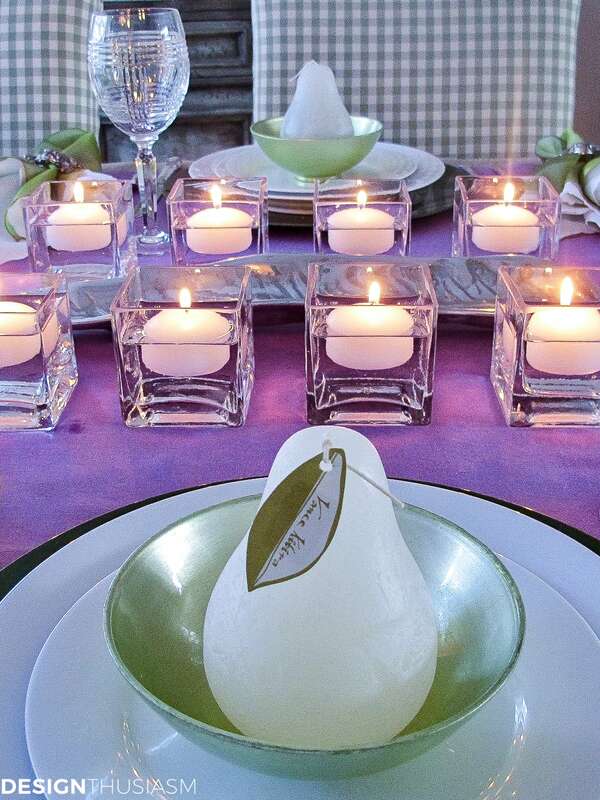 The other key element was the creamy pear candles, sculpturally placed in simple iridescent green bowls. 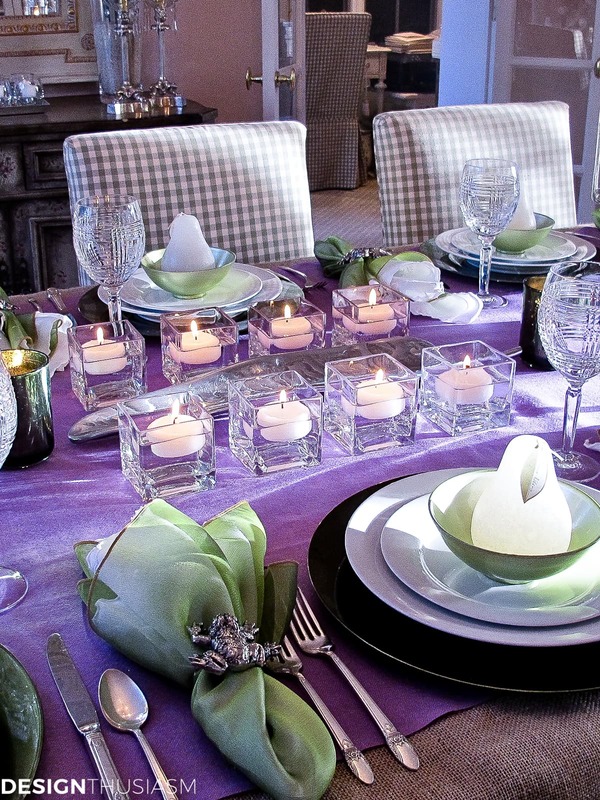 Floating candles in square votives rim the silver leaf dish that anchors the spring theme at the center of the table. 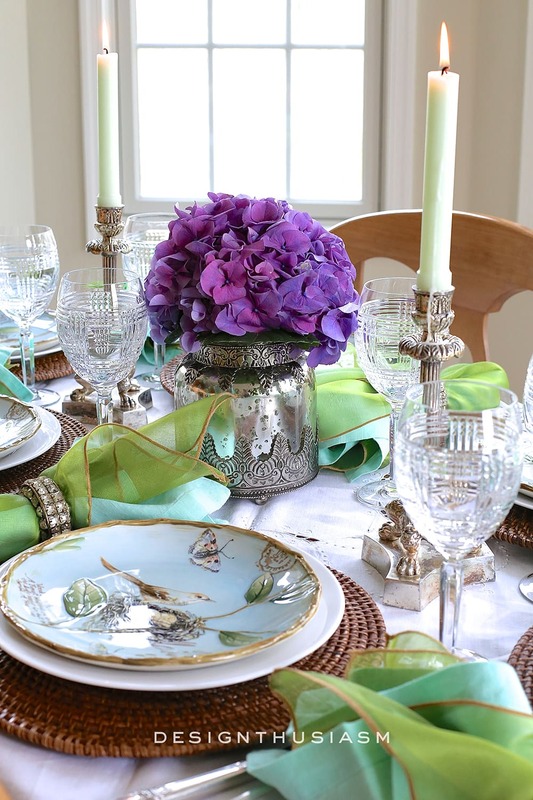 The warmth of the lilac pashmina contrasts the cool purity of the crisp white plates. 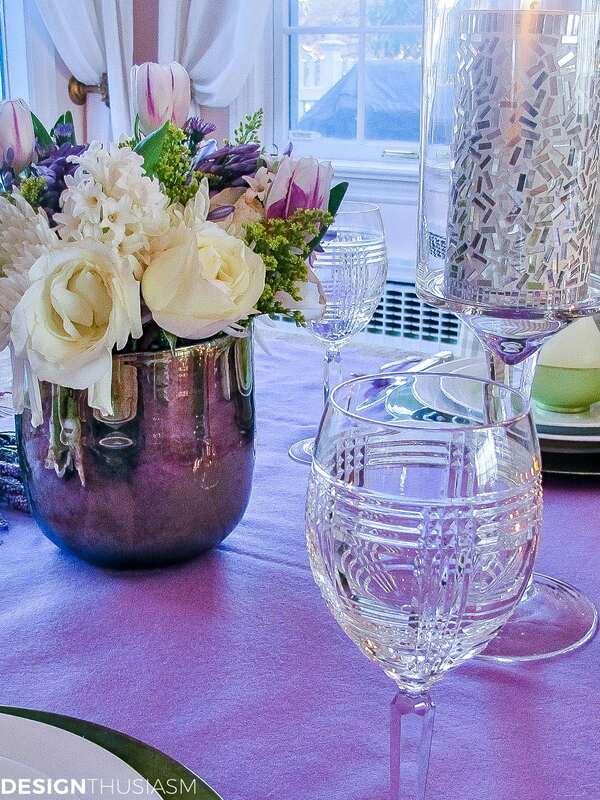 Glimmer is added through the mercury glass vases, the crystal goblets and the silver mosaic pillars. Layered napkins feature green iridescent napkins enveloping vintage white embroidered linen ones. The package is wrapped in silver frog napkin rings, another nod to spring. Vintage silver flatware is used as a soft touch. The sunlight streams into the room and finds much to highlight. 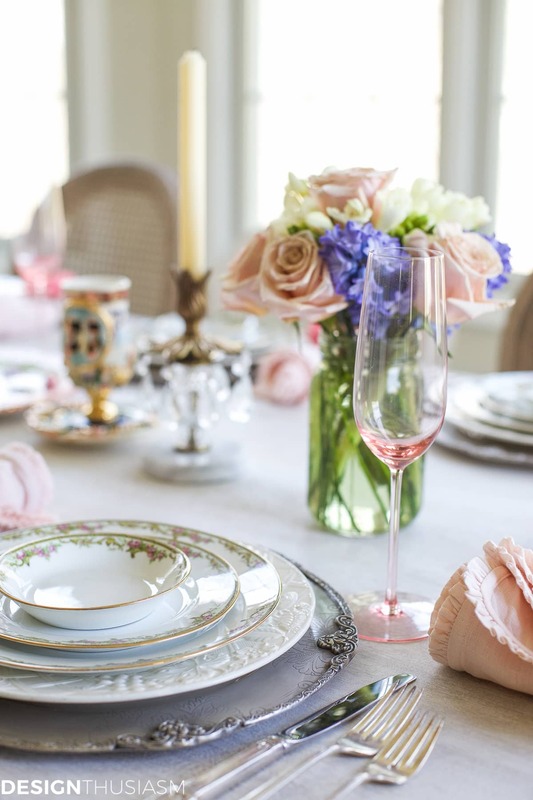 The clean look of the individual place settings lends a modern edge to the tableau. The mix of geometric shapes and candlelight add interest to the setting, but the story is really told through color. 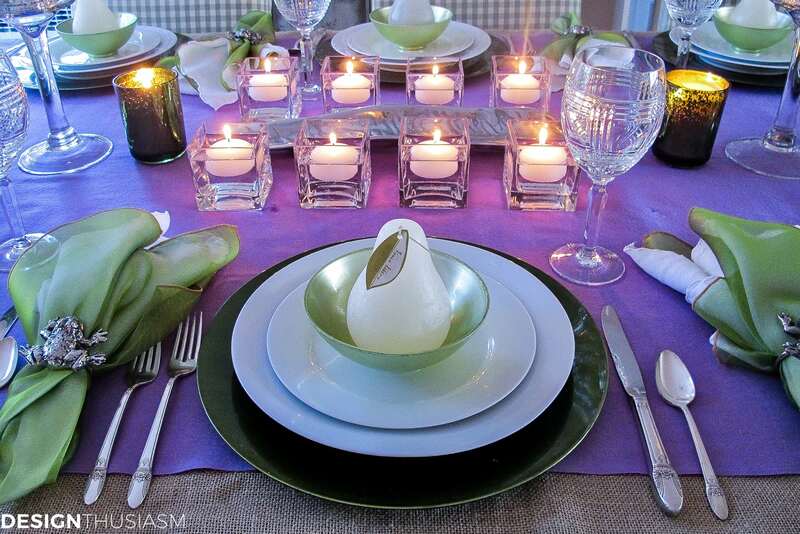 A view down the length of the table celebrates the light and an evening of pears and pashmina with friends. Beautiful as expected. love the pear tie in and your colors and shapes are displayed beautifully. Such a classy and sophisticated table setting. Anyone would be honored to sit at your table. Thank you so much Linda… 🙂 And I really appreciate the “as expected”, especially coming from you! Thanks Rosie, and thanks for stopping by!! Wow, wonderful tablescape! I am loving the detail and the thought put into it….and those candles are stunning! Lovely. The candles and the pears and all of the layers of textures add a lot of personality to the table. Very nice! A very stunning table full of beautiful pieces. Your talented use of the white plates grounded with the dark chargers and topped with the iridescent spring green bowl and pear candle creates a calm and serene setting. 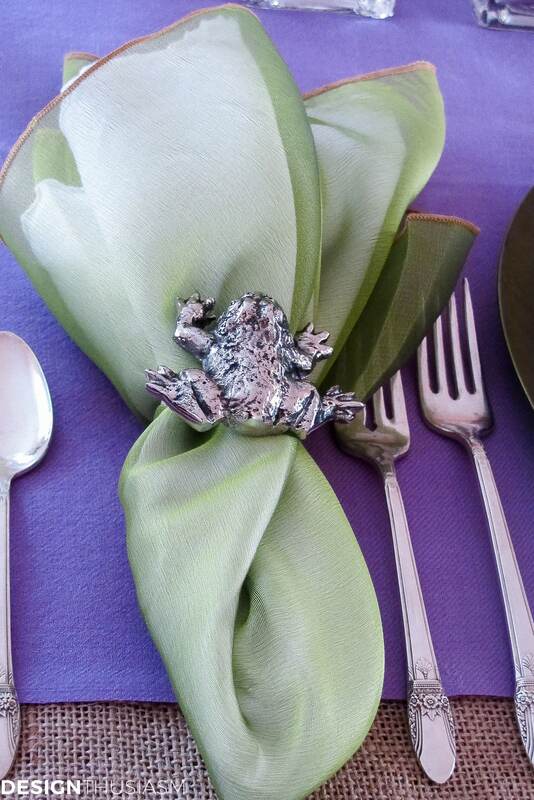 The frog napkin ring is the perfect touch of whimsey, bringing a smile. I love it. Thank you for visiting and leaving a comment on my blog. Elegant and beautiful! Love the coloring and how you captured the light. The flowers are perfection and I love the napkins with the frog! The silverware is so pretty and I like the candle centerpiece. Lucky friends to have set at this beautiful table! Thanks you so much, Liz!! Wow, what a treat for your friends! This is such and elegant setting! I love each element, especially those pear shaped candles! Just lovely!! I absolutely love this table! 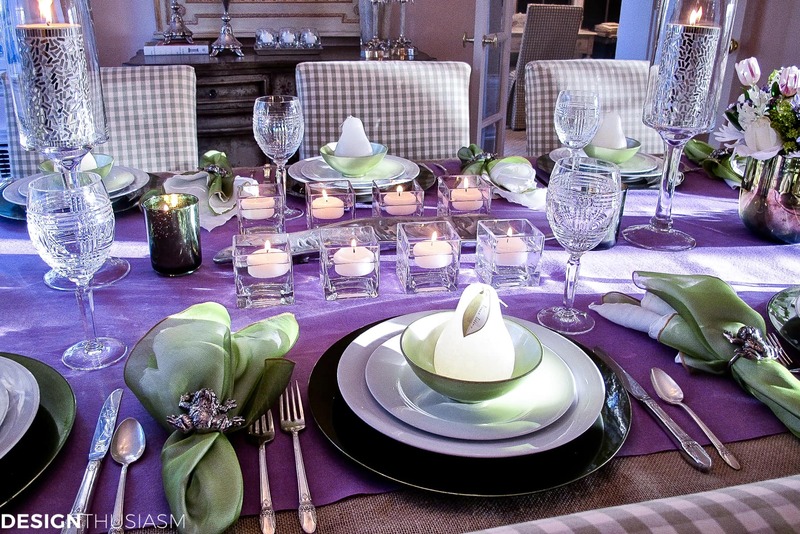 Love the shade of purple in the pashmina (that was very brave of you, because it’s really lovely), the iridescent bowls and napkins, the square vases with the floating candles . . . I saw those frog napkin rings at PB and just walked right past them. Now I’m sorry I didn’t pick them up! You’ve introduced a lot of different elements on this table, and yet, it doesn’t seem overcrowded. This is truly beautiful! Thank you for the inspiration! What a beautiful table and wonderful website. I just stopped by for the first time today and it is now one of my new favorites! You are a girl after my own heart with your lovely creations! What a pretty, pretty table. I especially like your little frog napkin holders. To me, they go with the green so well, with real frogs being green, and all, and they are just an unexpected little surprise tucked around the napkins. Why not use a pashmina? They wash! If the color is what you need, go for it! Thank you so much, Susie!! What a stunning table – I love everything, but what really caught my eye was the gorgeous fabric on your chairs!! I am new to your blog and enjoyed reading about St Tropez…I am heading to the Mediterranean in the fall and so anxious to take it all in. Your photos are just fabulous – I imagine you have an expensive camera because the photos just “pulled me in”! Off to read more on your blog!! Such wonderful creativity. Love the luminescent pears. 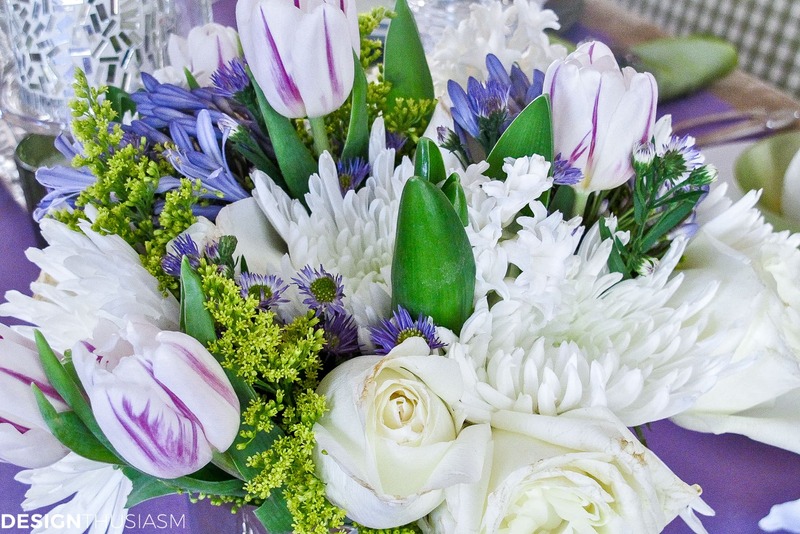 Beautiful color palette…perfect for the spring feel you were going for! 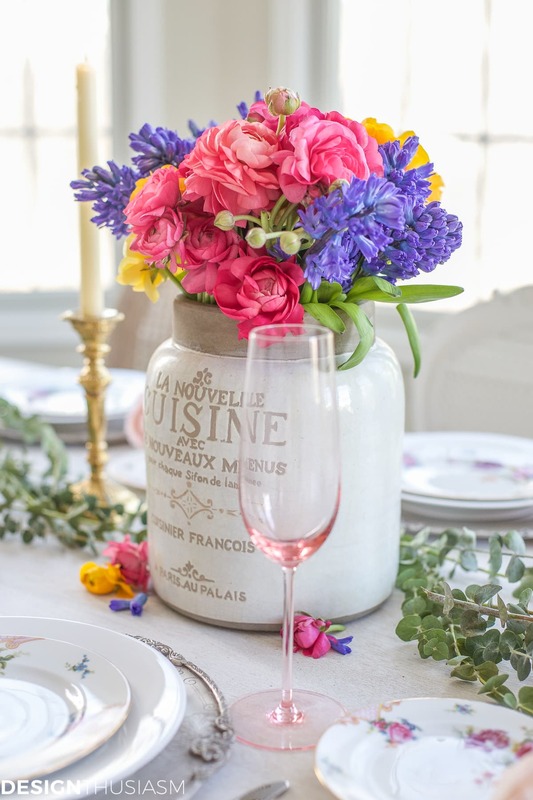 Love the flowers and all the pastels. 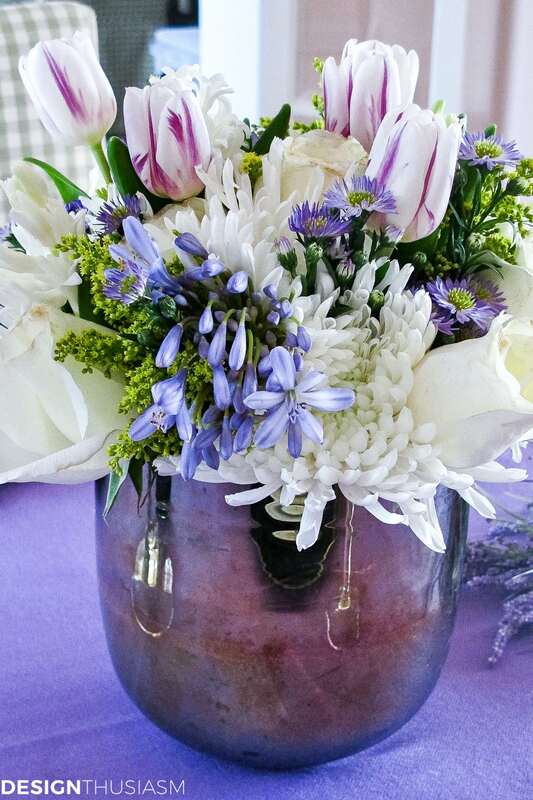 Lavender and green, so perfect for spring! The pashima scarf is very pretty indeed but I even loved the contrast of the beige weave underneath. I also really like the two rows of square clear votives down the center as well. 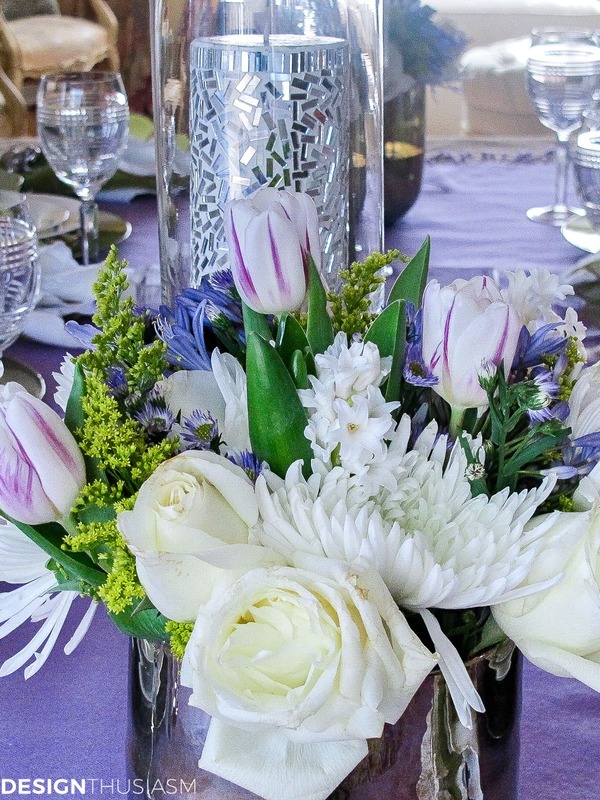 Beautiful flowers and settings all the way around! Thank you so much, Mary! This one is a little different for me because there are really no patterns, but I let the color tell the story. Glad it resonated with you… 🙂 Thanks for stopping by!! Stunning and elegant! Gorgeous flowers. 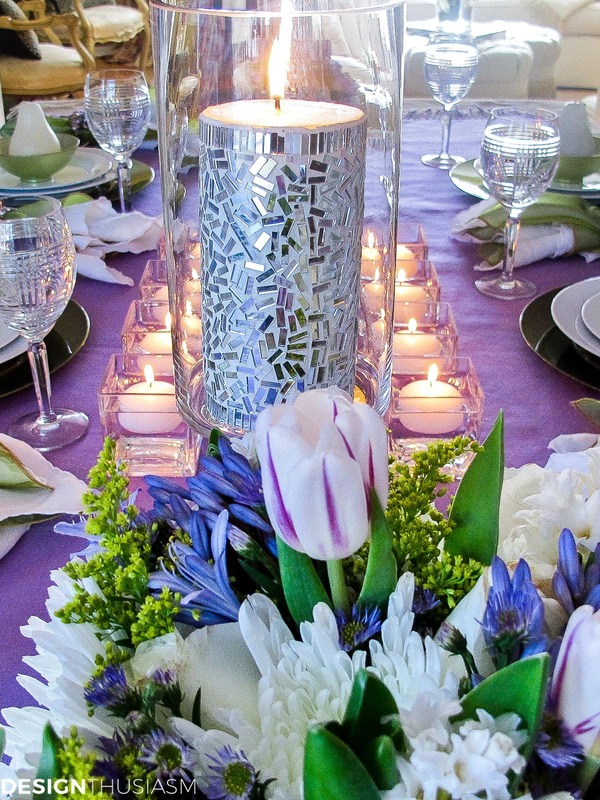 Love the pashmina, pear candles,elegant napkins and cute napkin ring. Your centerpiece is very creative. You are a great designer. I would love to know where you found your napkins. Thanks so much, Bonnie! The sheer green napkin that’s placed over the white one is from Pier 1. I have them in several colors because I love the sheen they offer as well as the ability to see another color underneath, whether it be white, or another color to mix with the layer on top. Thanks for visiting!! Lory, your tablescapes are amongst the most beautiful I’ve ever seen. You should share all you’ve posted and some new ones in a coffee table book. Thank you so much, Patricia, and it’s funny, because that’s exactly what I have in mind… 😉 Wish me luck! !